A safety valve is designed to open and relieve excess pressure from vessels or equipment and to reclose and prevent the further release of fluid after normal conditions have been restored. It is important to ensure that the safety valve is operable at all times and under all circumstances. A safety valve is not a process valve or pressure regulator and should not be misused as such. Safety valve operates for one purpose only: overpressure protection. In many cases, these are changed over periodically. During this change over procedure it is of huge importance that an open path to relief is maintained. A spare relief capacity enables continuous production while maintenance procedures take place. This eliminates the need to isolate and shut down the whole process. 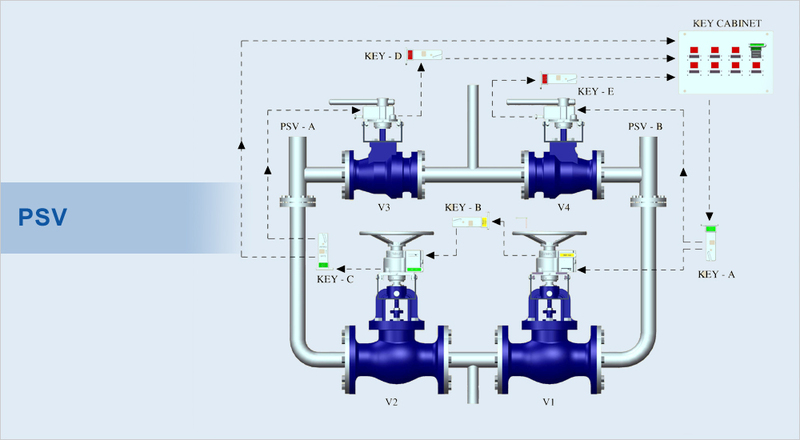 Usually, two or multiple safety relief valve systems are used. Valve Interlocks are fitted on the isolation valves in the PSV piping loop, ensuring switch over from a PSV which is being taken over for maintenance to the second PSV to be brought in to operations in predetermined sequence.